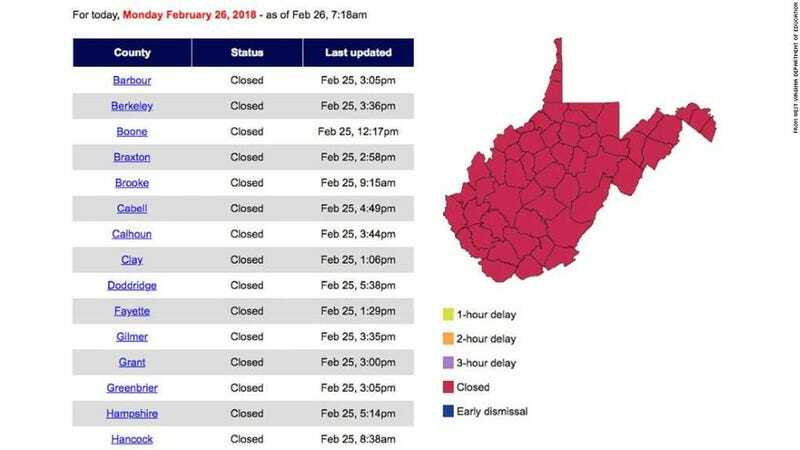 Public school educators in West Virginia have shut down all 680 public schools in all of the state’s 55 counties for a third day as their strike over better wages and benefits continues. West Virginia’s 680 public schools employ 19,488 classroom teachers and have enrolled 277,137 students, according to Alyssa Keedy of the West Virginia Department of Education. Teachers went on strike last week after Gov. Jim Justice signed legislation giving teachers and school service personnel a 2 percent pay increase starting in July, followed by 1 percent pay scheduled to go into effect in 2020 and in 2021. According to Christine Campbell, president of the American Federation of Teachers-West Virginia, that’s a reduction of the proposed pay increase, which was a 5 percent total increase in wages, compared with the 4 percent increase in wages over the next several years that Justice ultimately signed into effect. West Virginia ranks 48th in the nation for teacher pay, Campbell said, with teachers in surrounding states making (pdf) anywhere from $5,000 to $20,000 more than teachers in West Virginia. In addition, the bill did not address issues such as health care and a tax on payroll-deduction options, CNN reports. “These things got everyone here, brought everyone here, and signing a bill at 8 o’clock at night wasn’t going to change that,” Campbell told CNN. Protests at West Virginia’s Capitol began on Thursday, with thousands of teachers and supporters turning out to make their voices heard. Teachers carried that energy into day 3. As a lifelong educator, I fully recognize and support the work of our teachers and service personnel. Our educators are committed to their profession and dedicate their passions every day to providing West Virginia students with the education they deserve. Only as we are able to provide competitive benefits—inclusive of adequate pay and affordable healthcare—are we able to recruit and retain the best talent. I fully recognize that our teachers and service personnel deserve more and, I personally know the West Virginia Board of Education, our Governor and our State Legislators agree. Unfortunately, the economic realities of our state may not allow everything teachers deserve to take place immediately. I regret that circumstances have led to the announcement of a statewide work stoppage and I am working diligently with all parties to advocate for a prompt resolution. I am hopeful that action will be taken to prevent any disruption to students and classrooms. Work stoppages by public employees are not lawful in West Virginia and will have a negative impact on student instruction and classroom time. Families will be forced to seek out alternative safe locations for their children, and our many students who depend on schools for daily nutrition will face an additional burden. I encourage our educators to advocate for the benefits they deserve, but to seek courses of action that have the least possible disruption for our students. As the strike continues, local organizations have put together backpacks of food for students who otherwise would not have access to food during the school closures. “One out of 4 children in our area are food-insecure, meaning they don’t know where their next meal is coming from, and the meals that they can count on are the free breakfasts and lunches in the schools,” said Suzanne Brady, director of development and communication at Facing Hunger Foodbank in Huntington, W.Va.
Several counties in West Virginia are also establishing supplemental child care centers so that students have somewhere to go while parents are at work.